The Spa at Benardus Lodge has seven treatment rooms, an open-air “warming pool,” steam and sauna rooms, and a fountain-filled meditation garden. Indigenous herbs, flowers, essential oils and healing waters are incorporated into the spa’s treatments. Book the Vineyard Romance treatment, which includes a body exfoliation, lavender-grapeseed bath, warm grape seed oil massage and a tea service of grape seed herbal tea. Or try the Chardonnay Facial, an 80-minute, hydrating treatment that incorporates chardonnay grape seeds, which are loaded with antioxidants. 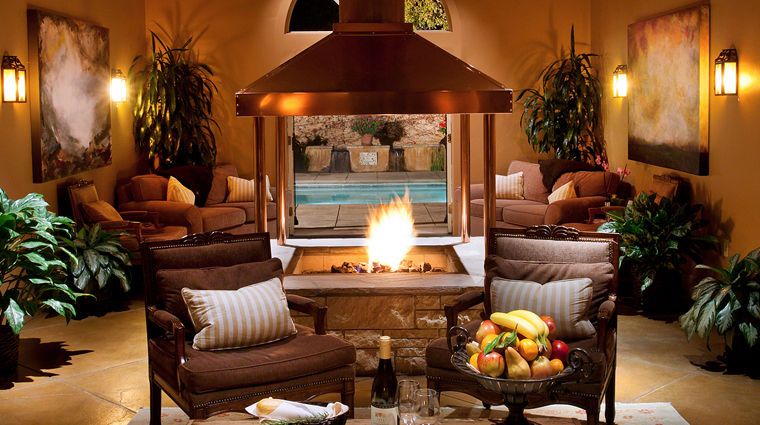 The spa’s signature treatment, the Carmel Valley Escape, includes a massage, facial, spa lunch and manicure and pedicure. Scanning the treatment menu at The Spa at Bernardus Lodge, you’ll find a number of unique treatments inspired by the Carmel Valley setting, surrounded by vineyards and gardens. The Winery was built with couples in mind, and its intimate spa is no different. Enjoy a couples treatment in the romantic, candlelit Vineyard room. The elegant spa has its own salon, convenient for those celebrating weddings and other special events on the premises. You’ll find lots of healthy refreshments and beverages during your visit the spa near Carmel-by-the-Sea. On our visit, the nibbles included dried cherries, almonds and dried apricots as well as a bowl with bananas, oranges and red and green apples. Pick up facial and body care products, jewelry and clothing at the inviting boutique. It’s hard to miss the retail area, since it doubles as the reception area for the luxury Carmel Valley spa. It’ll be tough to choose a treatment (or two), but when you’re ready to book your appointment, you can either call the spa directly or visit the spa’s website. 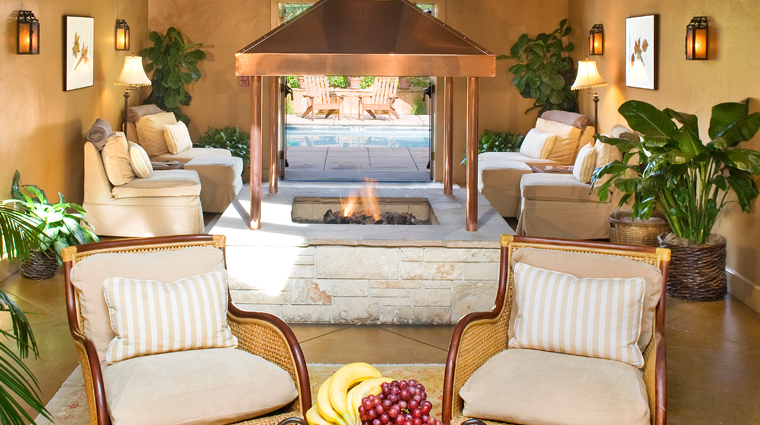 We know you don’t want to have to cancel or reschedule your reservation at this Bernardus Lodge sanctuary, after all, no one wants to miss out on pure relaxation. But things do come up, and the accommodating spa understands, just be sure to call the spa concierge at least 12 hours in advance. While any of the treatments at can be customized for men, the luxurious Carmel Valley spa offers a few specialized treatments created with men in mind, such as the Well-Groomed Man treatment. This innovative resort spa was the first to take the ultra-moisturizing McEvoy 80 Acres olive oil balm and turn it into a body treatment. During the Mediterranean Gold experience, you’ll be slathered in this fresh, green smelling balm, then the massage therapist will use hot basalt mineral stones to work it into your skin while relaxing your muscles. Also known as the “red carpet facial,” the Anti-Aging Enzyme Treatment is based on products by Arcona from Los Angeles promises to leave you with smooth and beautiful skin. The enzymes travel deep into the skin to cleanse and hydrate safely — meaning with no telltale red skin afterwards. Mushrooms aren’t just delicious — they’re loaded with antioxidants that are good for the skin. Based on products by Ajne of Carmel, the Mushroom Medley treatment starts with a foaming salt scrub scented with cepes mushrooms, oak moss and pine and finishes with a quick shower followed by a warm stone massage. Inspired by the Native Americans who inhabited the area that’s now Monterey County, La Stone Therapy contrasts warm basalt mineral stones and cold marble stones, which are lain on the chakras — the body’s energy centers. Bernardus Mélange is a fully customized treatment in which guests combine a 60-minute massage with a pair of 25-minute services. Add on a skin exfoliation, scalp massage, hand treatment or hot stones for 110 minutes of bliss. This one also can be done for couples. The wet areas at the cozy spa are quite luxurious and offer a variety of settings and treatments. Obviously, the most inviting wet area of the spa is the aqua outdoor warming pool, which is set to 100 degrees Fahrenheit. 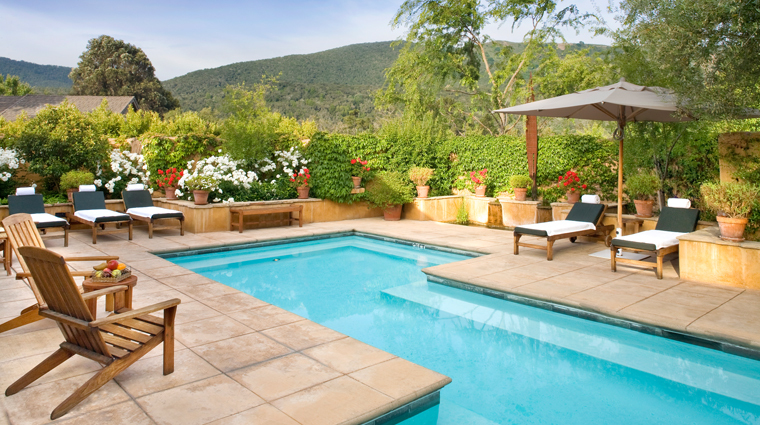 A dip in the private pool ringed by flowering daisies and geraniums, chaise lounges and mature trees is a great way to relax your muscles before or after a deep-tissue massage. Inside the locker rooms, you’ll find a dry sauna, showers and a eucalyptus steam room. We suggest you grab one of the ice-cold hand towels infused with rose petals and cucumber, and then spend a few minutes listening to music and breathing deeply as the steam opens your pores. There’s also a showerhead in the steam room in case you need to cool off before stepping outside. A few of the massage rooms include showers that are employed during body scrub treatments, but the most impressive wet feature at the spa is the special Vichy shower.